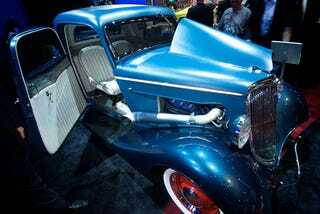 Mix up something old, something new, something borrowed and something blue and you've got the Ecoboosted '34 Ford which debuted here at SEMA. It's a marriage of Ford's latest engine technology with one its most-loved body styles. We like it. This little coupe might look old, but it's an all-new car, with a new old stock body, new suspension and interior bits. What's most intriguing is what's going on under the skin though. Up front is the first front-to-back application of Ford's EcoBoost engine lineup. It's a 3.5 liter twin-turbocharged EcoBoost unit developing 400 HP, 400 lb-ft of torque and, here's the tricky part, mated to an engine plate adapter and then hooked to a Tremec TKO five-speed manual transmission. Very nice. We're thinking those little goodies need to make it into the Ford Racing catalog pronto. Detroit Street Rods did a fine job putting this little gem together. DEARBORN, Mich., Oct. 28, 2009 – Hot rodders have always lived by the motto "There's no replacement for displacement," indicating that the more cubic inches an engine has, the better the resulting performance. Ford Powertrain and Detroit Street Rods are out to prove that thinking out-of-date with their EcoBoost™-powered '34 Ford hot rod. To be introduced at this year's Specialty Equipment Market Association (SEMA) show, the Ford hot rod will be the "first" rear-wheel-drive application of the 3.5-liter twin-turbo EcoBoost V-6 delivering an estimated 400 horsepower and 400 ft.-lb. of torque – power numbers that easily rival a typical hot rod's 302-cubic-inch V-8 or even a modern-day V-8 of similar size. "EcoBoost technology shows that there is a viable replacement for displacement," said Dan Kapp, director of Ford Powertrain Research and Advanced Engineering, who will be part of a SEMA "Driving Green" technology briefing panel discussion during the show. "As consumers' demand for fuel efficiency continues to grow, and our commitment to delivering best-in-class fuel economy remains steadfast, it's important to show that performance does not need to suffer as a result." "Hot rod builds provide blank canvases for SEMA member companies and SEMA is uniquely positioned to demonstrate that horsepower and green power can coexist without sacrificing performance or the cool factor," said John Waraniak, SEMA vice president of Vehicle Technology. "This '34 EcoBoost hot rod is a fantastic example of modern green technology being applied in a manner that any performance enthusiast would love." The EcoBoost family of engines uses turbocharging and direct injection technology to deliver up to 20 percent better fuel economy and up to 15 percent fewer CO2 emissions versus larger-displacement engines. "The beauty of EcoBoost is that it enables us to downsize for fuel efficiency, yet boost for power," said Kapp. "We're able to decrease the size of the available engine – such as installing a V-6 versus a V-8 – yet boost the power using turbocharging to deliver similar power and torque to that larger engine." The first EcoBoost engine, a 3.5-liter twin-turbo V-6, launched this year on the 2010 Ford Taurus SHO and Flex and on the Lincoln MKS and Lincoln MKT. The EcoBoost V-6 produces 355 horsepower (365 hp in the Taurus SHO) and 350 ft.-lb. of torque. Ford has recently announced the first four-cylinder EcoBoost engines, launching in global applications beginning next year. The 1.6-liter EcoBoost I-4 first arrives in Europe, followed by the 2.0-liter EcoBoost I-4 launching on products in both Europe and North America. Following the launches of the new EcoBoost I-4s will be the extension of the 3.5-liter V-6 to the first rear-wheel-drive configuration in the F-150 pickup truck late next year. Another global application, the Ford Falcon sedan in Australia, will receive a rear-wheel-drive version of the 2.0-liter EcoBoost I-4 in 2011. The fun-to-drive nature of EcoBoost engines is leading Ford to introduce these fuel-saving powertrains in large volumes virtually across its lineup. For example, by 2013 more than 90 percent of Ford's North American lineup will be available with EcoBoost technology, and nearly 80 percent of Ford's global nameplates will have an available EcoBoost option. By 2013, global EcoBoost volume throughout the Ford, Lincoln and Mercury vehicle family is expected to be 1.3 million units, with up to 750,000 sales coming from North America alone. Detroit Street Rods' latest build is a 1934 Ford and is a joint venture with Ford Motor Company and Experi-metal. In this '34 application, the EcoBoost engine is configured for rear-wheel drive and is coupled with a Tremec five-speed manual transmission. "The decision to use the EcoBoost engine for our powertrain on this project was an easy one in that it gave us the opportunity to combine the iconic '34 Ford sculpted body lines with the advanced technology of the EcoBoost powerplant," stated Robert Smith, president of Detroit Street Rods. "The result is the perfect hot rod marriage of advanced technology for power and legendary automobile design." While the stock Honeywell turbochargers that drive the EcoBoost engine are used, they were repackaged to fit the engine bay of this all-steel replica body. The engine configuration and turbocharger packaging was dynamometer tested by Ford Powertrain for proper calibration of the engine electronic control module (ECM). In addition to the all-stock engine, other components including the fuel pump, ECM, fuel pump module, fuel pump processor and drive-by-wire throttle were utilized in their original production configuration. The body is from Steve's Auto Restoration and is the recently released 1934 Ford 3-Window coupe. The complete body and fenders are from brand-new tooling, and are designed, stamped and manufactured by Experi-metal in Sterling Heights, Mich. This "replica" '34 features all-steel construction, full fenders, running boards, electronic power windows, air conditioning and custom bumpers. The engine was repackaged and fitted with an engine plate adapter to mate with an aluminum flywheel, performance clutch and a Tremec TKO five-speed transmission. The turbochargers were repositioned to the front of the cylinder heads and custom aluminum tubing was used to route the air from the custom air cleaner through the air-to-air intercooler. The exhaust gases are routed from the cylinder heads through coated headers, through the stock wastegates, and pass through large custom exhaust cones located outside the engine bay and just above the front fenders.